My seemingly never ending DIY project to produce a homemade GEM equatorial telescope mount continues to progress, albeit slowly. Read more for an updated photograph of this project. Making a GEM (German Equatorial) telescope mount for astrophotography is a major project and I've had this one ongoing in the workshop for a couple of years. Every so often a little bit more metalwork gets finished. Read about making telescope worm gears here. 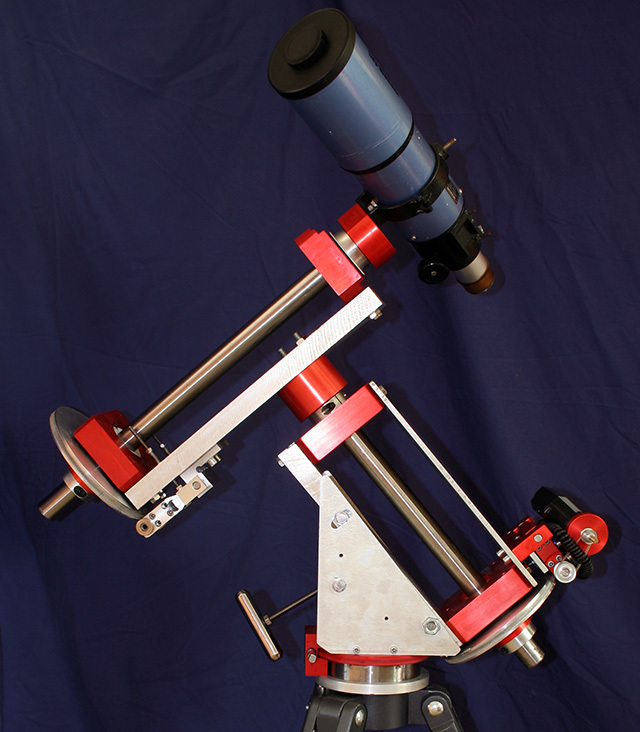 Some further details on my telescope mount project here. The project had stalled briefly with the two axis and base of the telescope mount complete. However, I'd got stuck on the best way to mount the DEC (declination) axis worm gear. I'd made a bit of a mistake making the worm housing and couldn't figure out how to spring load this worm without starting a whole new worm housing. Today I forced myself to tackle these issues, and now the DEC worm is pressing against the worm gear on the DEC axis of the telescope mount. The solution was putting holes in the DEC axis plate and passing M5 stainless studding through and spring loading from the other side of the DEC plate. I've also finished and anodised the boss at the business end of the DEC drive for attaching a telescope. I've attached my little 80mm achromatic guidescope to the top - obviously I need some plates up that end, but this was just for the purpose of a photograph. Next things to do include buying some more pulleys and the timing belt and getting the DEC motor attached to the completed DEC housing. Then all the components up that end need to be anodised. Once that is done, I can actually take the mount outside for the second time and have both axis motorised for testing the GOTO. If the GOTO works, then I've got something right! It is quite a useful Go-No go test. I also need a better quality worm gear for the RA (right ascension) axis - the periodic error on the first attempt is too high. It is better than my existing telescope, but I feel I can do better. I'm hoping his DIY homemade GEM telescope mount project might actually see first light before new year!